Does Matthew McConaughey Smoke? - Do They Smoke? He is the youngest son of Mary Kathleen McCabe who was a substitute teacher and James Donald McConaughey who was an oil pipe businessman. 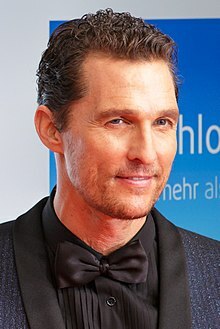 He was born in Uvalde, Texas but Matthew Mc Conaughey grew up in Longview, Texas. He graduated from a local high school at Longview, Texas. As a child, Matthew McConaughey also showed interest to his father’s business but still he dreamed to become a lawyer. He lived for a short period of time in Australia. He returned in the United States of America to study Film at University of Texas. He obtained popularity when he played an important role in the different award-winning films such as Angels in The Outfield, Sahara, The Wedding Planner, Amistad and A Time to Kill. He was asked to play as Jack Dawson in Titanic until Leonardo diCarpio accepted the role to be Jack Dawson. He is the husband of Camila Alves McConaughey and father of Levi Alves McConaughey, Vida Alves McConaughey and Livingston Alves McConaughey. → Proof that Matthew McConaughey is or used to be a smoker.